We are the manufacturers of SOLAR WATER HEATERS - ETC FPC Both types. We manufactures all types of water heating systems as- CLOSE LOOP SYSTEMS ,HARD WATER ,PRESSURISED SYSTEMS. A solar water heater consists of a collector to collect solar energy and an insulated storage tank to store hot water. The solar energy incident on the absorber panel coated with selected coating transfers the hat to the riser pipes underneath the absorber panel. The water passing through the risers get heated up and is delivered to storage tank. The re-circulation of the same water through absorber panel in the collector raises the temperature to 80°C (maximum) in a good sunny day. 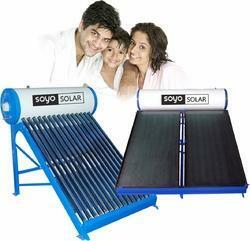 This total system with solar collector, storage tank pipelines is called solar hot water system. With modern technology and elaborate detailing, Soyo has come up with solar heaters that are easy to install and maintain. You have to expense only one time and you can enjoy hot water life time absolutely free from natural sun power. Thus, providing hot water for longer baths and refreshed living. 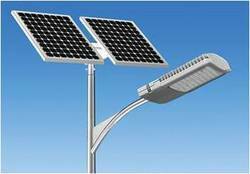 We manufactures and SITC of solar street lights as per MNRE specifications and custom built too.Till date we have the experience of more that 10000 street lights. We also manufactures the All in one street lights with -Lithium Ion and Lithium ferrophosphate batteries.